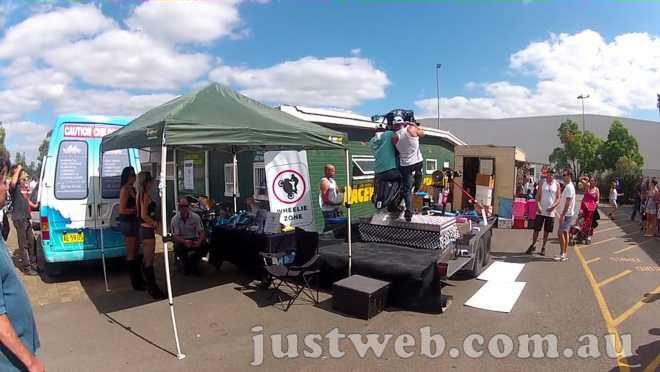 Learn how to wheelie a motorcycle safely & legally on this wheelie simulator at a motorcycle wheelie school in Sydney. This year, as I have done in past years, I attended the 2012 Hard 'n' Fast Bankstown Custom Motorcycle Show again on Good Friday. The crowd was huge, and, as in years gone by, there were new demonstrations, displays, and trade stalls to keep everyone entertained. One of the new attractions this year was a wheelie machine. This is essentially a wheelie simulator, a real sports motorcycle mounted to a hydraulic system on the back of a trailer which allows the "rider" to learn how to wheelie a motorcycle - safely and legally. I would have loved to have seen a Harley mounted up on the wheelstand machine, but I guess a bike is a bike. The wheelie bike is owned and run by Wheelie Zone, which is located in Sydney, Australia. On their website they state that they are a "school for controlled / balanced wheelies", and that they have specially designed, real life simulators which you can use under instruction from their experienced staff. They can teach you to perform fully controlled and balanced wheelies without any risk of "rider" injury, or damage to your own pride and joy (your bike). The lack of injury risk would bode well if you actually have a job you are expected to turn up for. All of Wheelie Zone's machines are fully transportable and can be hired along with a qualified operator. They even have public liability cover to operate at almost any venue, which may include motor racing events, promo days, carnivals, custom bike shows or private events. There was always someone on the bike all through the day, so it seemed to be a very popular attraction. As far as their motorcycle wheelie school goes, all training is carried out by their experienced and highly qualified staff. I assume the amount of training you require depends on you - how much experience you have and how quick you learn. You have to remember that these are not cheap, plastic arcade type rides - they are REAL motorcycles, so good training is essential not only for your safety, but also so the expensive machines are not damaged. They teach riders how to do a wheelie in stages, thus each individual has to pass a test of sorts before moving onto the next step of their wheelie tuition. Take it from someone who knows: wheelies require thought and experience - there is a lot going on to get the front end of a heavy bike up in the air - and keep it there. Multitasking is essential.